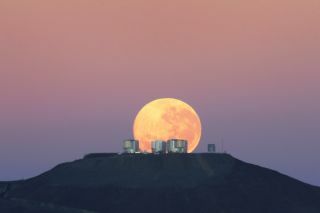 The dazzling full moon sets behind the Very Large Telescope in Chile's Atacama Desert in this photo released June 7, 2010 by the European Southern Observatory. The moon appears larger than normal due to an optical illusion of perspective. Full Story. This story was updated at 3:32 p.m. ET. Thanks to a fluke of orbital mechanics that brings the moon closer to Earth than that it has been in more than 18 years, the biggest full moon of 2011 will occur on Saturday, leading some observers to dub it a "supermoon." At its peak, the supermoon of March may appear 14 percent larger and 30 percent brighter than lesser full moons (when the moon is at its farthest from Earth), weather permitting. Yet to the casual observer, it may be hard to tell the difference. The supermoon will not cause natural disasters, such as the Japan earthquake, a NASA scientist has stressed. The moon has not been in a position to appear this large since March 1993. Although a full moon theoretically lasts just a moment, that moment is imperceptible to ordinary observation. During the day or so before and after, most will speak of seeing the nearly full moon as "full," with the actual shaded area of the lunar surface being so narrow – and changing in apparent width so slowly – that it is hard for the naked eye to tell whether it's present, or which side it is. In addition, the near coincidence of Saturday’s full moon with perigee will result in a dramatically large range of high and low ocean tides. The highest tides will not, however, coincide with the perigee moon but will actually lag by up to a few days depending on the specific coastal location. For example, in Wilmington, N.C., the highest tide (5.3 feet) will be attained at 11:21 p.m. EDT on March 20. In New York City, high water (5.9 feet) at The Battery comes at 10:49 p.m. EDT on March 21, while at Boston Harbor, a peak tide height of 12.2 feet comes at 1:31 a.m. EDT on March 22, almost 2 1/2 after perigee. According to the Observer’s Handbook of the Royal Astronomical Society of Canada, residents of regions along the shores of the Bay of Fundy in eastern Canada, the 10- to 20-foot (3- to 6-meter) swell in the vertical tidal range makes it obvious when the moon lies near perigee, regardless of clear skies or cloudy. Any coastal storm at sea around this time will almost certainly aggravate coastal flooding problems. Such an extreme tide is known as a perigean spring tide, the word spring being derived from the German springen – to "spring up," and is not, as is often mistaken, a reference to the spring season. In contrast, later this year, on October 11, the full moon will closely coincide with apogee, its farthest point from the Earth. In fact, on that night the moon will appear 12.3 percent smaller than it will appear this weekend. When the perigee moon lies close to the horizon, it can appear absolutely enormous. That is when the famous “moon illusion” combines with reality to produce a truly stunning view. For reasons not fully understood by astronomers or psychologists, a low-hanging moon looks incredibly large when hovering near trees, buildings and other foreground objects. The fact that the moon will be much closer than usual this weekend will only serve to amplify this strange effect. So … a perigee moon, either rising in the east at sunset or dropping down in the west at sunrise might seem to make the moon appear so close that it almost appears that you could touch it. You can check out this out for yourself by first noting the times for moonrise and moonset for your area by going to this website. If you'd like to share your supermoon photos of the March 19 full moon, contact SPACE.com managing editor Tariq Malik: tmalik@space.com. Joe Rao serves as an instructor and guest lecturer at New York's Hayden Planetarium. He writes about astronomy for The New York Times and other publications, and he is also an on-camera meteorologist for News 12 Westchester, N.Y.